Domesticated: Taming Giganotosaurus is a dangerous prospect. Its rage reaction, even when tamed, can sometimes cause it to briefly turn on members of its own tribe. Indeed it may even throw off its rider if it has been sufficiently angered! And yet, the sheer size and immense power that the Giganotosaurus possesses means that some factions endeavor to tame it as a fear-inducing "capital" best of war -- even at great risk! You should add an incubator to hatch eggs and get baby Dino’s also a syring and a DNA combiner to make HYBIRED DINO please. And some today animals like chameleons or wild hogs. And all animals can have blood taken from them for DNA plz and it hurts them a little bit. And to get DNA from the blood a DNA extractor. I would just love hybired Dino’s plz or just the baby dino would be good anouth for me. Can there plz be some terra forming plz. Can you make one of the BOSSES an indominus Rex plz and make it tame able plz but it you need too use 150+ trank arrows plz. If you like my suddjestons reply plz you think anything needs changed tell me plz. 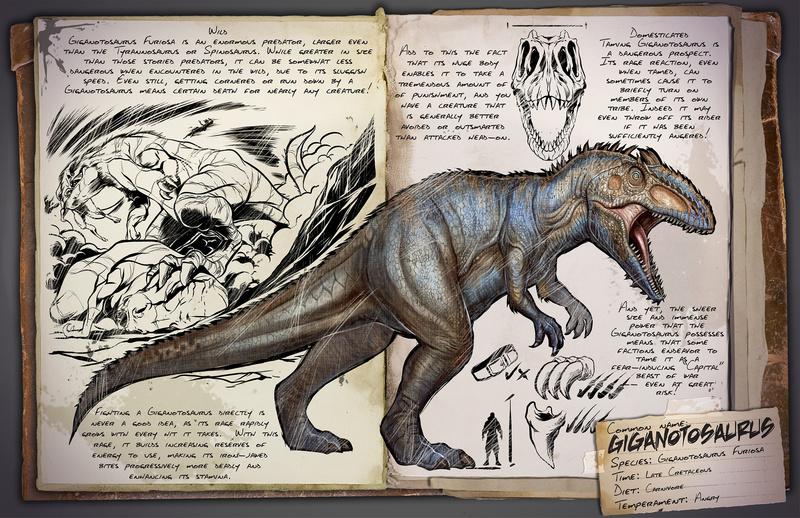 The Giganotosaurus will be terrifen when it’s in the game. I love that you added it being a danger even to its owners once agitated enough. That kind of off sets the OP of a creature so large. Hopefully the spawn rates are not nearly as high, or at least specified to certain zones. Something like this shouldn’t be toooo easy to get. It’s FAR too big…i know it’s not supposed to be 100% realistic…but this is taking it too far…it’s completely inconsistent with the enstablished “reasonably realistic” state of things. I know there are dragons and stuff…but aren’t those supposed to be super rare uniqe creatures outside of normal echosystem? And to be even more specific…i was very happy to finally see a game that was going to handle rex and spino in a non-JP3 way…with spino finally scientifically accurate and balanced in the right niches when confronted to a t.rex…and then WHAT pops out from the dark distant past? DINO CRISIS 2 GIGA!!! I plan to buy the game on ps4…please PLEASE PLSEASEEEEE!!!!! RESIZE that eye punching monstrosity ASAP and never again fall into the “bigger is always cooler hell with consistency” trap again. Not this again. Spinosaurus recent reconfiguration has left egg on the faces on the people who made JP3. Now we are back to Gigatosarus being larger than Tyrannosaurus Rex again. Because somebody has too. Read Scott Hartman’s article on his website. You don’t to make the same mistake as JP3.